The Big Idea: Learning to appreciate differences between themselves and others is a skill that kids can build. 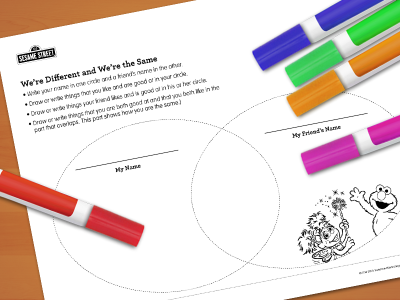 Print the page and help kids think of a friend to describe (or, kids can complete a page in pairs). Fill in the circles with things that only they like, things that only their friend likes, and things they both like. Point out that friends can introduce us to new things that we never knew we liked. If everyone liked the same things, we’d never try anything new—things might get a little boring!